Ah yes, this is the season of hope. Hope that the quince will finally fruit; hope that the slugs have given up seedlings for lent and the pigeons are developing a taste for weeds; hope that there won't be a late frost... oh, and hope that our backs will stay strong through the hours and hours of weeding ahead of them. And hope that the pigeons get sick of the taste of yellow crocus! This time of year is one of hope and grandiose ideas. Yes, that anticipation of greater things to come. Warmth, growth, new projects. Can't wait. I envy you your greenhouses. They must prolong and enhance the anticipation. I agree about the grandiose ideas Lisa - the hard bit for me is translating them into reality! Having just stepped outside this morning and felt the soil squelch beneath my feet I think it will be a greenhouse day again today. I just hope the rain keeps off because the roof leaks! But all that aside it is a lovely place to be and watching more seedlings emerge each day does fill a gardener with a great sense of satisfaction. How odd - we had a totally squelchy one yesterday and today is a gift from the garden gods ! Warm sun and blue skies so ... stuff the greenhouse today, it can wait until a rainy day! Hope the rain keeps away for you Jessica and doesn't drip on you! This makes me wish I had a greenhouse or at least had started seeds in the window this year. I will probably go the straight to ground method and hope for the best. I am doing direct sowing later this month, Phillip, as I am starting a cutting garden for the first time. Usually when I direct sow in the borders I end up 'weeding' out all the seedlings by accident! Dear Jane, what a beautifully written post, well it is more of an essay! I could so much relate to it. In terms of my garden I am always hopeful and in essence that this year the garden will be better than last year. Actually I really have come to appreciate that gardening is not about instant gratification. It is about nurturing, caring, carefully planning for the future. Sometimes when you for example plant an oak tree even for the next generation. I loved seeing all your germinated seeds! The seedlings look so happy and healthy. There is something so satisfying in watching in watching them grow up and become wonderful plants. Usually I don't grow plants from seeds, but this year I sowed sweet peas and it made me so happy to see the little seedlings appear. I am also growing dahlias not from seeds but from tubers and some of them have poked their new shoots through the soil already, yay! Wishing you a wonderful garden season ahead. Hope is eternal! Thanks for your comments Christina. I'm glad you have enjoyed growing your sweet peas. It is very satisfying! I am waiting for my dahlia tubers to shoot - patience is another virtue all gardeners need to cultivate ! Hi Jane, This is the season where hope runs rampant!Just the sight of new life breaking the ground and old life rebreaking and growing new stems is so much fun. I'm really looking forward to your posts as the season progresses. Happy Gardening! Thank you Sally. Happy gardening to you too - enjoy the excitement of spring! Taking cuttings is extremely satisfying isn't it ? I nearly gave up on a Begonia cutting which I was trying to root in water,I had it in my hand to throw away ... then I saw tiny roots ! So pleased! I wondered earlier on this morning why I was outside in a rather cool biting wind with secateurs in my hand pruning a rather wayward shrub. 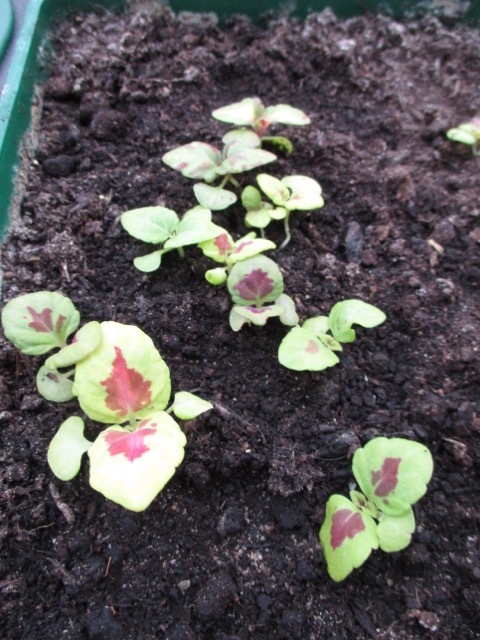 Like you though Jane I think that it is hope that is the driving force :) Exciting signs of growth in your greenhouse. I hope that there was still time to toast your toes and sip hot chocolate when you got back indoors. Ha ha Anna ! Oh yes, always time for toasting the toes at the end of a long day! One quality gardeners must have is patience and another is perseverance. Shovels full of it Sue! Perseverance in the face of adversity is a necessity! Hope, yes, that is exactly the gardener's most strong feeling, especially in spring. We must be an optimistic bunch ! I have grown ginger lilies for the first time last year. I cut the folage off mine before winter, do you always leave it on yours? Any tips about their care would be welcome. Likewise Brian! We bought some from the Urban Jungle in Norwich last spring and I must admit I have been very cautious with them - perhaps over cautious. I have lifted them all and brought them into the heated greenhouse or conservatory. I believe some varieties can take a couple of degrees of frost though. 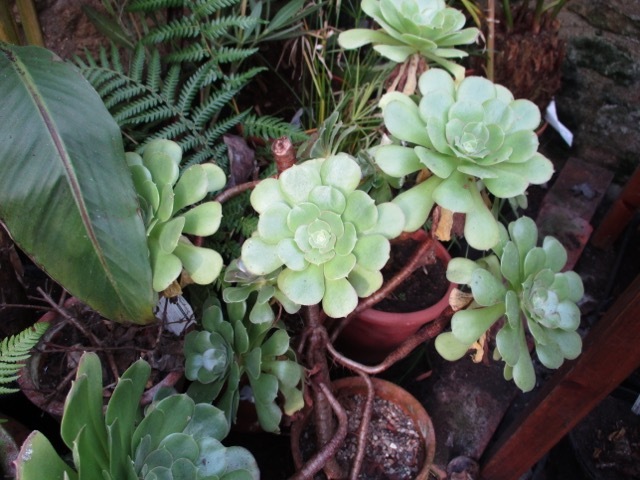 Mine have kept their foliage over winter and are now pushing out new spears. 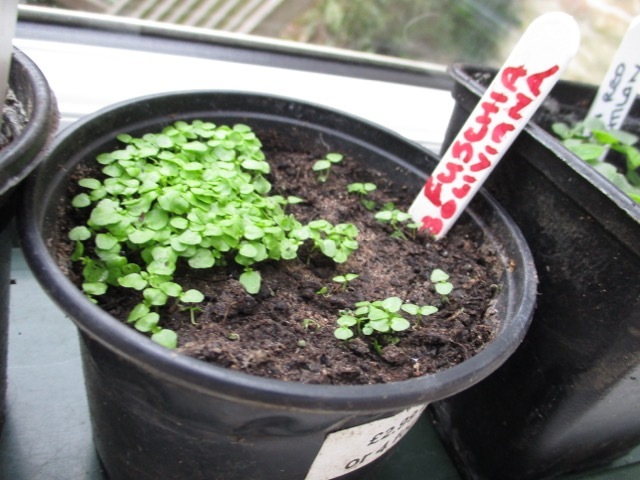 It's great to see your seeds are coming up. It's the start for whole new garden year after a long wintertime. I wish i had the space in my little garden for a small greenhouse. Hi Marijke, it has seemed like a long winter here too and spring is most welcome! 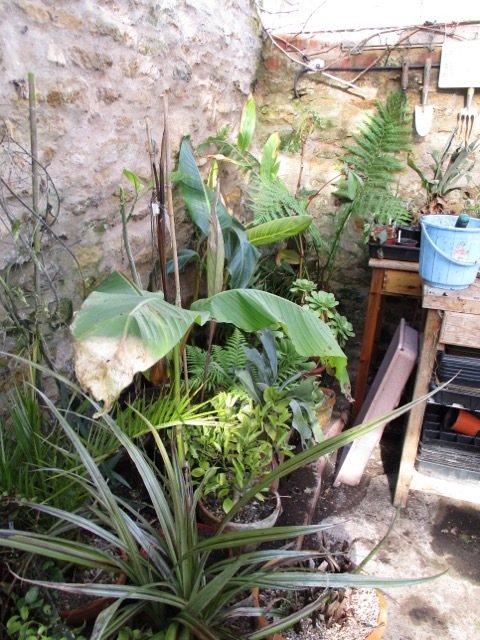 Shame you can't fit in a tiny greenhouse as it adds such an enjoyable dimension to gardening - and gives you somewhere cosy to work when the weather is bad! I'm growing 'Extreme Double' dahlia, too. 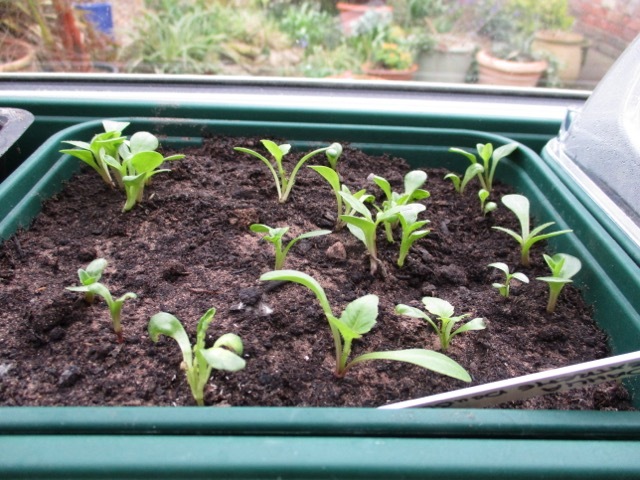 :) Seeing my trays of seedlings sprout and push out new life is exciting and a reminder of what lies ahead. Lovely to see all your fresh young seedlings. Not sure I can say that I am good at deferred gratification, though. Same here when chocolate or wine is the subject! OK with plants though ! A highly deferred comment, as I read your post days ago, then had to leave before commenting at all ;-) At any rate, hope and deferred gratification would seem to be two sides of the same coin, so surely we gardeners get the best of the deal. Seeing the new shoots coming up is half the fun! Those new shoots are coming up ridiculously quickly at the moment Amy! Not much waiting is involved at present !! Hope must propel us all. There are many signs of it in this post. Hi Ricki, we just have to hope we see things through to successful fruition! Wow, you're growing Abutilon from seed!? We have one bare, sorry looking plant that I'm hoping will come back, even after running over the lower stems with the lawnmower. Oh well, one can but hope!? 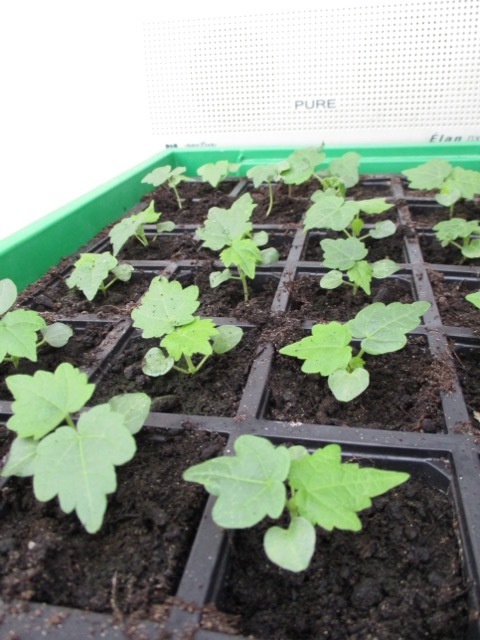 Get sowing Sunil :-) Abutilon are some of the easiest seeds I have ever sown ! I grow dahlias from seed because they will flower in the same season, so for a very small cost I increase my stock of dahlias every year. Also, they are so easy from seed, and I enjoy growing them. I dig them all up at the end of the season and overwinter the tubers too. Dahlias are my favourites ! I just can't get enough !! 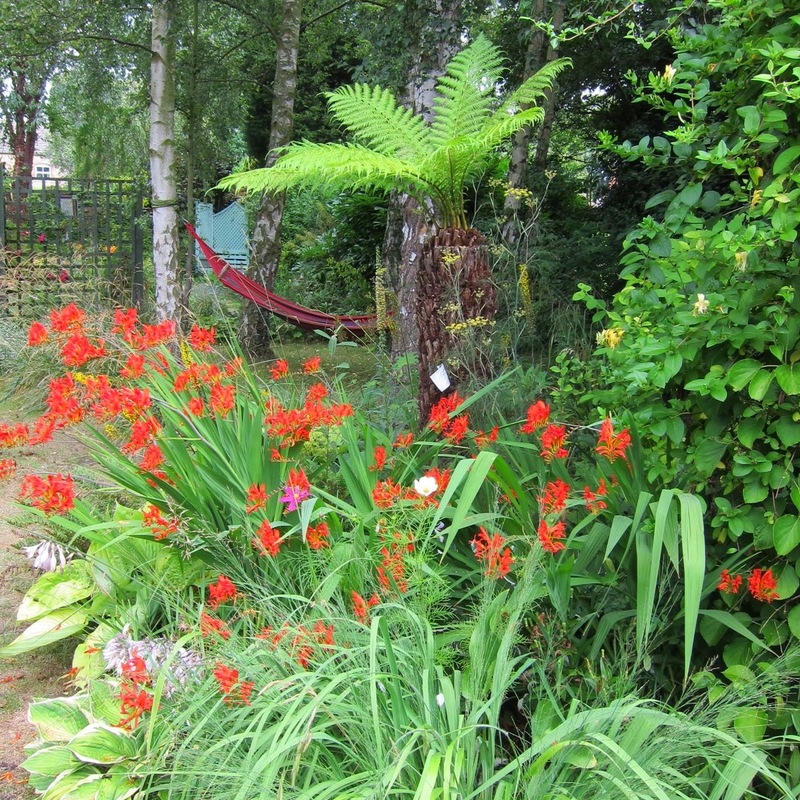 Even hardy plants can have difficulty surviving in particularly harsh or extreme weather. By wrapping them up for insulation you can be sure they'll survive the winter period and thrive again in summer. 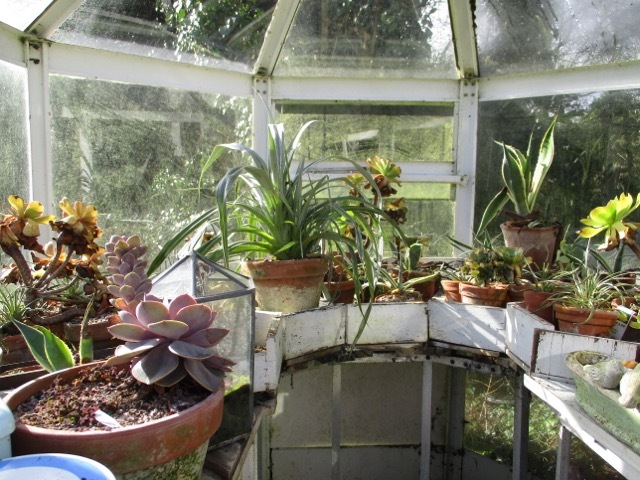 Great article, I have lifted them all and brought them into the heated greenhouse or conservatory. I believe some varieties can take a couple of degrees of frost though. Thank you so much.